On April 22, 2004 former Arizona Cardinals Defensive and Corporal of the United States Army Rangers Patrick Tillman, was killed in Sperah, Afghanistan. Having rejected a $9million NFL contract in order to serve his country, Tillman was rightly commended. The sacrifice of a soldier for his country secures immortality through the respect and gratefulness of the people he or she fought for, and it is this that makes the events following his death all the harder to accept. Despite the numerous cover-ups, the true events of April 22 were eventually revealed. Tillman was in fact killed by friendly fire, a cause that had been hidden from the Tillman family for weeks after Patrick’s death. THE TILLMAN STORY is an insight into the conspiracy, propaganda and ultimate failings of the system. In hiring Philip Sheppard, director Amir Bar-Lev chose a composer with a strong history of documentary scoring. Notable previous works include the space-faring documentary “In The Shadow of the Moon”, a stirring accompaniment to the retelling of the Apollo missions in the ‘60s and ‘70s. 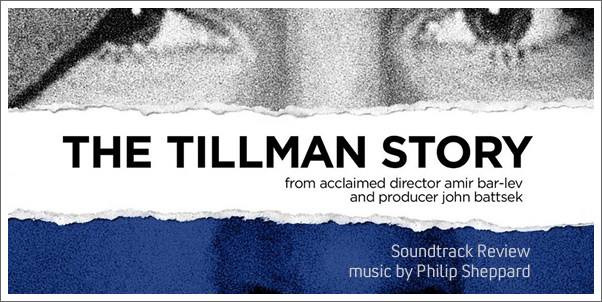 Firmly familiar with the documentary formula, in the case of THE TILLMAN STORY Sheppard has composed a score that does the job but does little to go beyond the call of duty. Consisting of two distinct parts, the soundtrack weighs in at a seemingly generous 32 tracks. However the majority of these last for no longer than a minute and a half each.